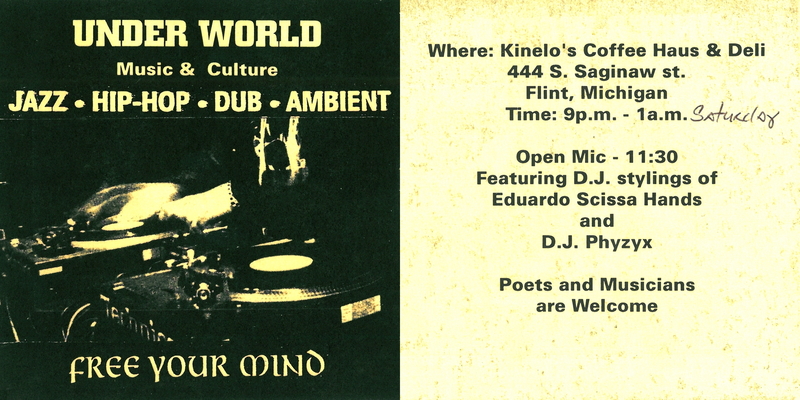 In 1995-1996, I had my first DJ gig in downtown Flint at a coffee house called Kinelo’s (which was later called Beans & Leaves, and currently The Lunch Studio). The name of the night was Underworld, and the host and mastermind behind the night was Rudeboy. 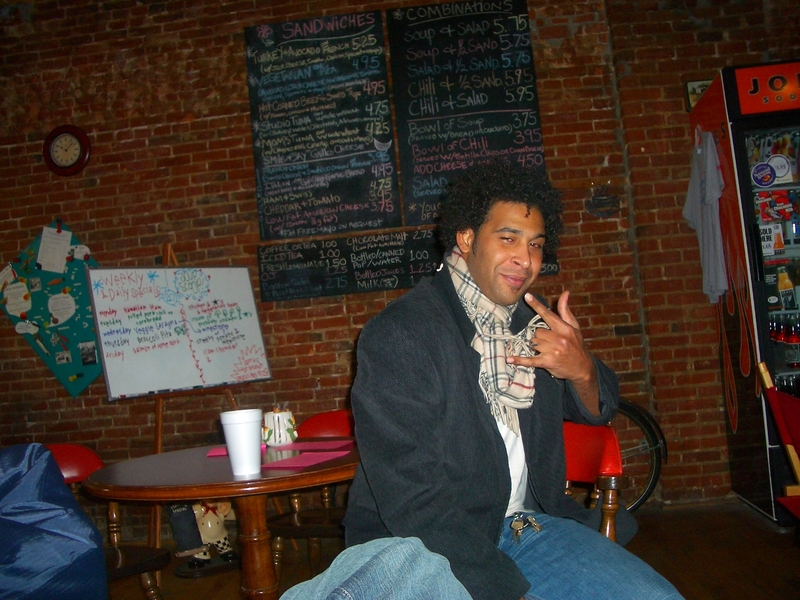 Rudeboy had spent some time down in Atlanta, where he experienced a weekly night at a cafe that had poetry, DJ’s, live musicians, and an open mic for MC’s. 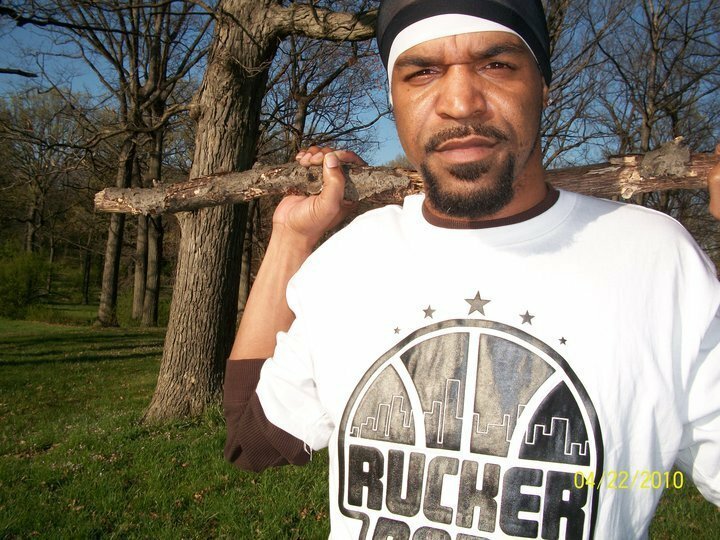 After coming back home to Flint and realizing how dead/non-existent the culture was, he set out on a mission to try and bring that type of vibe to Flint and represent “real” Hip Hop as a culture. 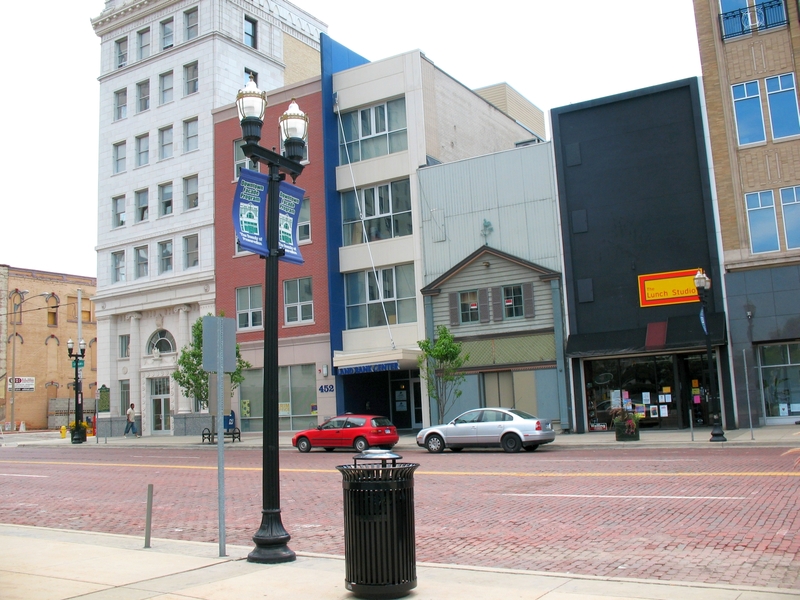 Mind you, this was back when the vast majority of people in Flint and surrounding areas were into the whole Dayton Family/Gangster Rap craze. 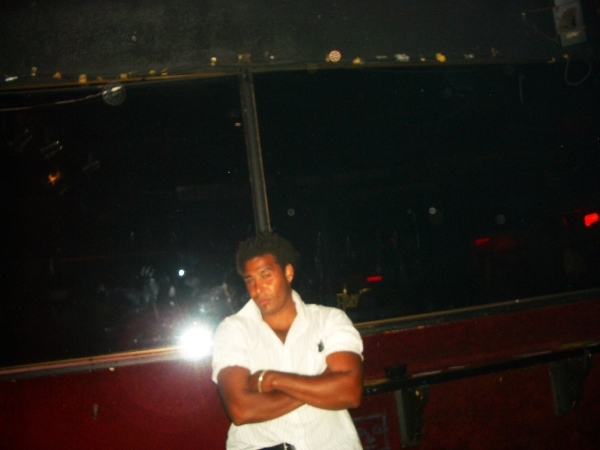 Before hooking up with Rudeboy (above right), I first got to know his friend Santino (above left). I met Santino at a record store that he was working at in Flint, and I also saw him around the University of Michigan-Flint campus a lot. 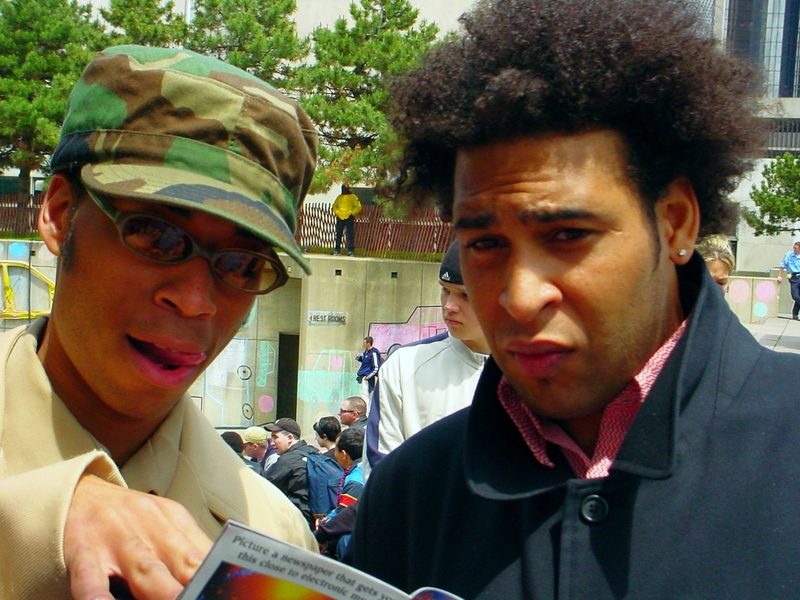 He told me about a friend of his (i.e., Rudeboy) who was thinking of starting up a Hip Hop night and wanted to know if I would be interested in meeting him. So one afternoon in early 1995, Santino introduced me to Rudeboy at Kinelo’s, where he first told me about his idea for the night. He explained how he already had a DJ already lined up for the gig (i.e., Eduardo Scizzahandz), but that he felt like he needed a second DJ to help round out the music of the night. Of course, I jumped at the opportunity to finally have a “real” gig, and the DJ duties were split between Eduardo Scizzahandz and me. I had never met Eduardo Scizzahandz (pictured above) before the Kinelo’s gig, but we clicked pretty quickly because of our shared interests in music. 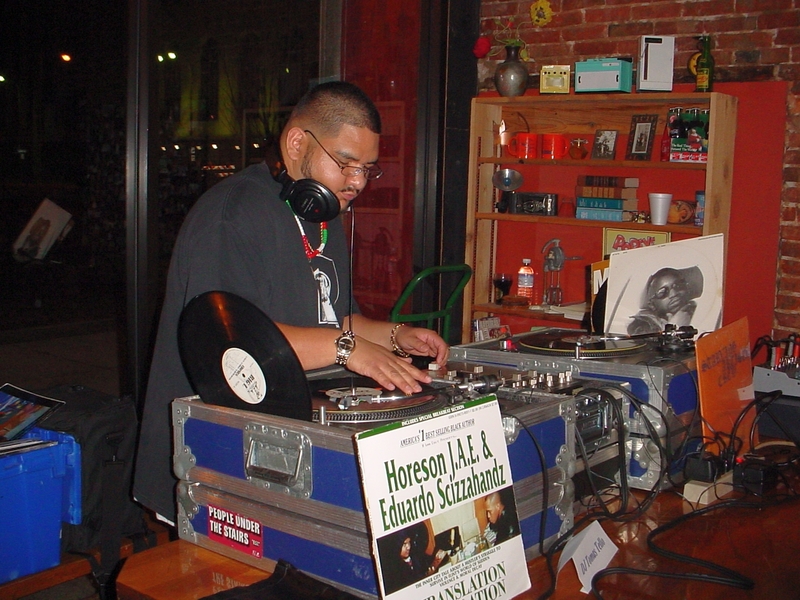 Musically speaking, I played more of the stranger, abstract music of the times (e.g., Acid Jazz, Trip Hop, Drum & Bass), and Eduardo Scizzahandz played more of the “real” Rap and Jazz/Funk originals that were heavily sampled. Technically speaking, I was more into mixing and blending and Eduardo Scizzahandz was more into cuttin’ and scratchin’. 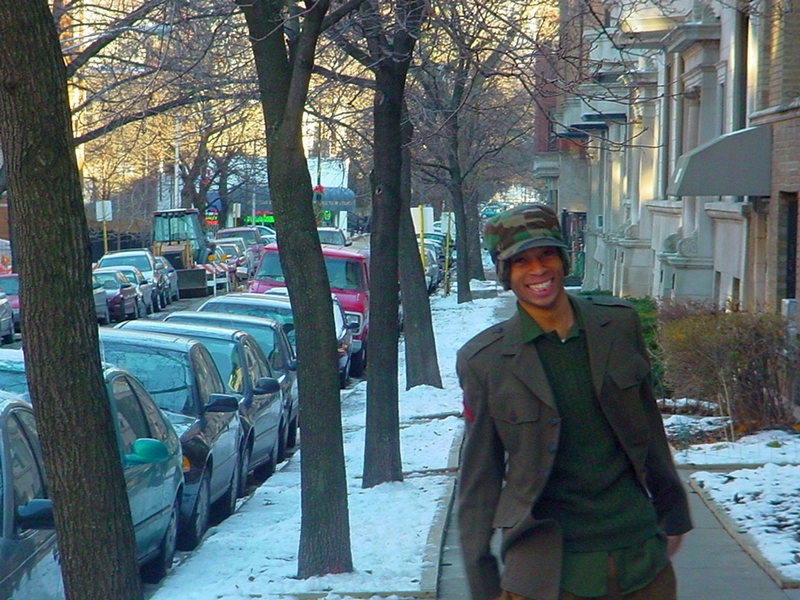 I tape-recorded the majority of the poetry, rap freestyles, and live musicians at Kinelo’s… so when I made my “Underground Hip Hop 1996 Volume 3” mixtape, I decided to include some of the best parts from these open mic sessions. There were a lot of unimpressive, garbage performances on these tapes, but a few of them actually stood out and ended up on the mixtape. 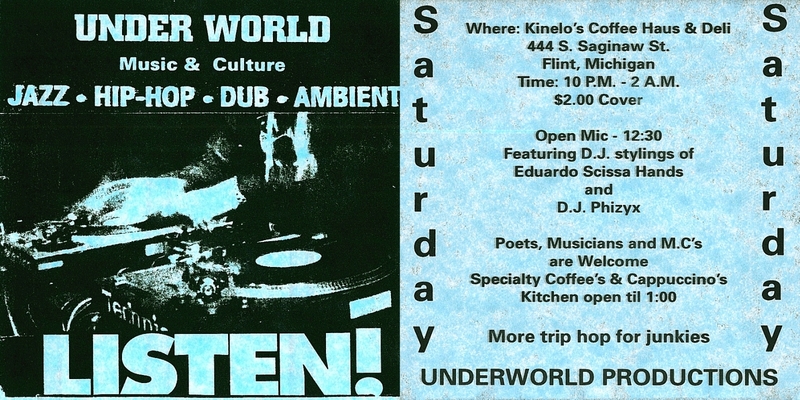 I wanted to capture the vibe of the Under World night on the mixtape, and I made it with the Kinelo’s regulars in mind (i.e., for those who came to the Under World night, week after week). 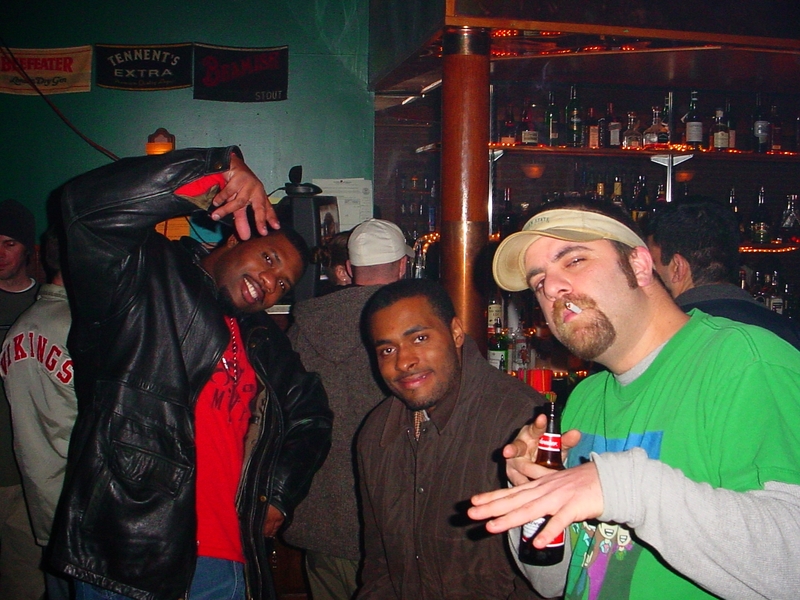 I wanted to include freestyles from some of the rapper’s that they saw and heard every week, some of the Trip Hop and newer underground Rap music at that time, songs from the DJ/scratch culture that was beginning to emerge, etc. 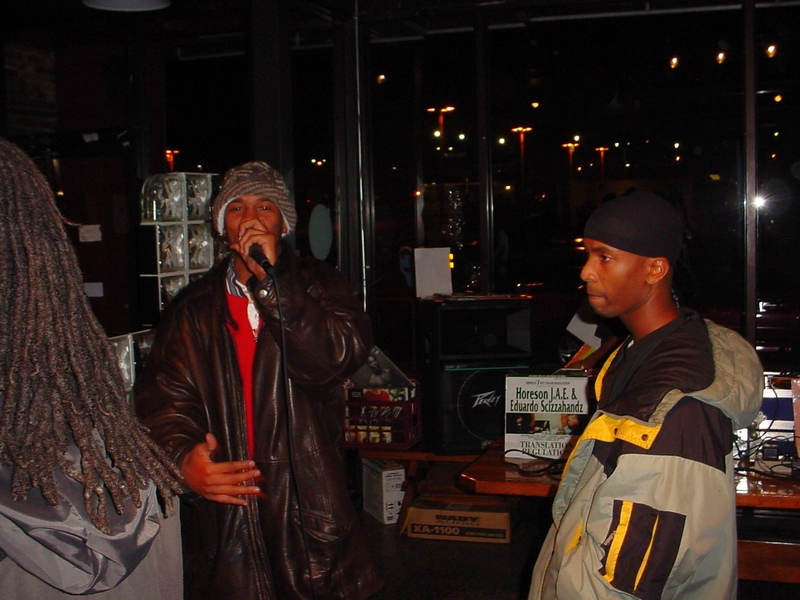 Over the years, I’ve had the pleasure of working with a couple of the MC’s that dominated the open mic portion of the night. 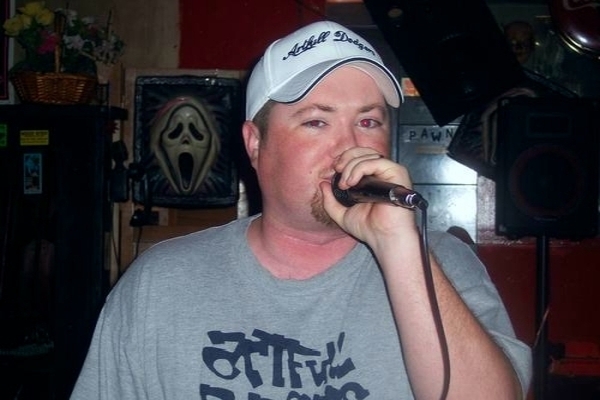 The one that shined the most went by the name of Supreme, and I put a lot of his Kinelo’s freestyles on the “Underground Hip Hop 1996 Volume 3” mixtape. 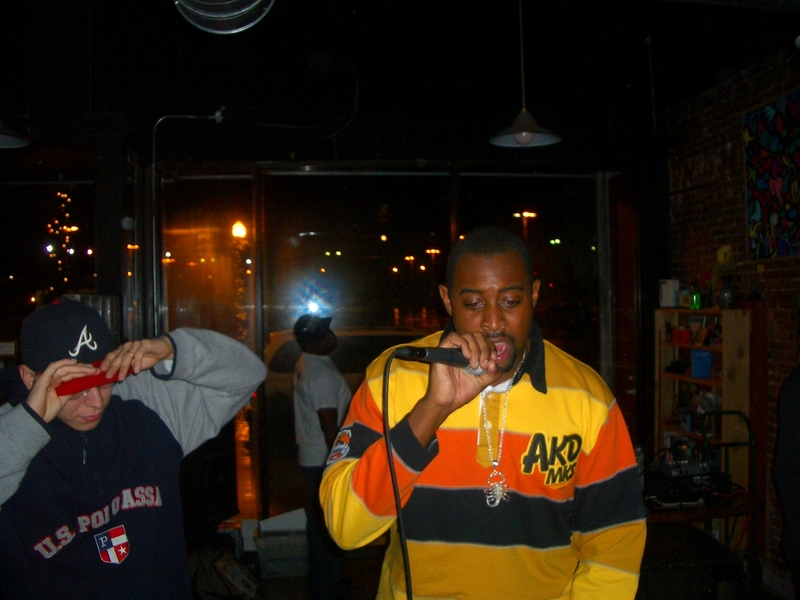 I asked Supreme and Amadeus (his partner at the time), to come in to Boomin’ Records to record a couple of songs for me. They recorded under the name Illistic Descendent Family, and did “Highly Intoxicating” for me in 1996 and “Move The Battlefield” for me in 1997. “Move The Battlefield” begins and ends with outtakes from Kinelo’s where you hear Rudeboy explaining the open mic rules to the MC’s. These two outtakes are absolute classics and very relevant to this day! You have to keep in mind that at the time of Kinelo’s and the recording of these songs, 95% of the MC’s in Flint sounded like this. And this. And this. And this. And this. And this. And this. Out of all of the songs that I’ve produced over the years, the one that Rudeboy did for me back in 1997, called “Mind Over Matter”, is probably my best song. I was wondering where the underground vol 1 & 2 are? I think I have the jewel case for vol. one but no cassette. What is up man!?!! ‘Nuff respect! I didn’t include Volumes 1 and 2 from 1996 because I didn’t think that they were good enough to showcase on my site. I always regarded 1996 Volume 3 as my first real “official” mixtape. All of my previous tapes were just not “up to par”. I demonstrated absolutely no (zero) skills in my earlier tapes. For 1995, I had Underground Hip Hop Volumes 1-5. I even had a couple of Underground Hip Hop tapes for 1993 and 1994. But they weren’t interesting. Nothing special. Yes, the songs on them were all dope, but “actual” mixtapes they were not. I would play an entire song, from beginning to end, and then play the next song just as that one was ending. Terrible. Embarrassing. Not anything that I want to be remembered for. I’ll try and upload 1996 Volumes 1 and 2 for you and email you the download link. Give me a couple of days!! Good to hear from you! Looks like this may be the link to Universal Magnetic instead of Underground Hip Hop 1996 v. 3. On my mission now to download everything on this site! Cool man, thanks! I will check it out when I get home! Worked perfect man! I am downloading like crazy, lol. thanks! 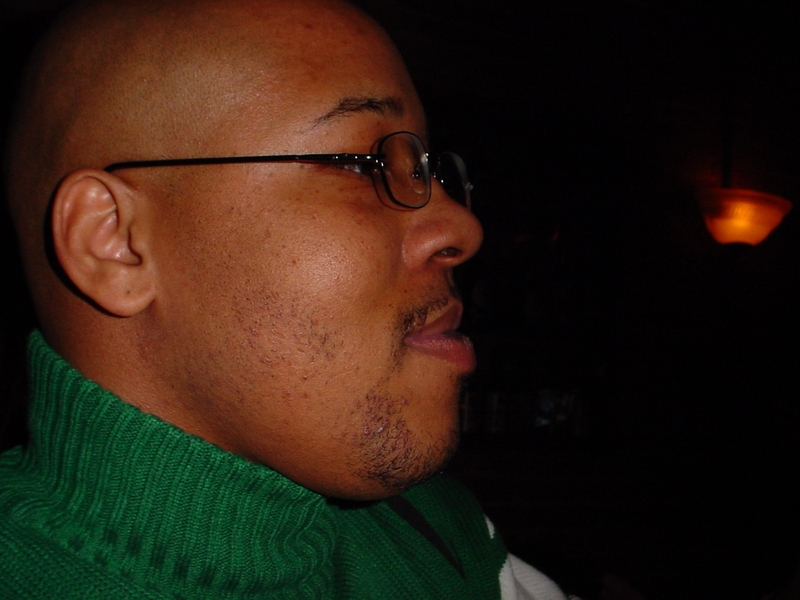 This site is mostly an archive of the 10 years I spent as an active participant in the mid-Michigan/Detroit music scene. It also contains some of my more recent mixes. Mixes are listed on the front page in order of release date (from newest to oldest… from left to right, top to bottom). Powered by Portfolio+ and yo mama, protected by the red, the black, and the green, with a key... ZOOM!